With Cupcake155 running fairly smoothly, I opted to typically drive it via Octoprint. I use a Raspberry Pi Model A+ with Wifi. This works great. After a few months printing like this, I found I’m constantly annoyed by visibility; I can’t see WTF’s going on in my print-area. Illuminatrix is my lighting system for 3D printing. It could be used for other applications. 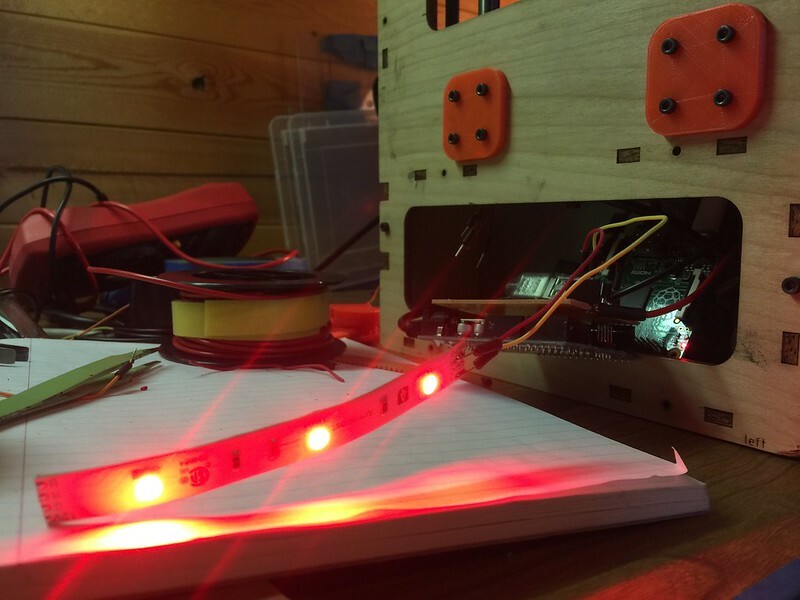 Illuminatrix is the combination of a dedicated Arduino to drive RGB LEDs, some optional power hardware if you want many LEDs and there’s an Octoprint Plugin component that grants print-status awareness to the lighting. Illuminatrix’s source code & documentation are concentrated on github, here. Illuminatrix is also discussed on its project page on Hackaday.io, here. I’ve posted a demo video of Illuminatrix as of mid Jan 2016 below.